Jill, I agree, beautiful artwork makes such a difference - opening this package was like opening a christmas box! Els, what a work of art that headpiece is, so tiny and delicate! 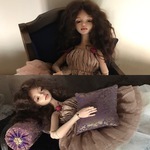 SisterFox, I love your doll so much, and your artwork is really beautiful. I am proud to display Winter in my home. Anthony, thank you and yes the headdress is metal,and silver and beads, so much work must have gone into it! Lovely, lovely girl...and i love all the extras that came with her! Marina, I love your winter! She's really something special!